This sandwich calls for roasting a small pork loin. If you're short on prep time, roast the loin a day ahead or, if your local grocery sells it, simply use presliced roast pork. And if you think that ham and roast pork is porcine overkill, fudge it and simply choose one meat or the other. Preheat the oven to 450 degrees. Position the rack in the uppermost position. Combine the orange juice, garlic, oregano, oil, salt, and pepper in a small bowl. Pour the marinade over the pork in a small baking dish and turn to coat. Let the pork sit in the marinade, at room temperature, turning often, about 15 minutes or until the marinade is mostly absorbed. Pour out excess marinade and roast the pork 40 to 50 minutes, turning it over halfway through to brown evenly; remove when a thermometer inserted in the middle of the loin registers 140 degrees and the center is lightly pink. Let the pork rest 10 minutes before slicing thinly. Assemble the sandwiches: Combine the pickles and mustard in a small bowl. Divide the mixture among the sub rolls, spreading in an even layer. 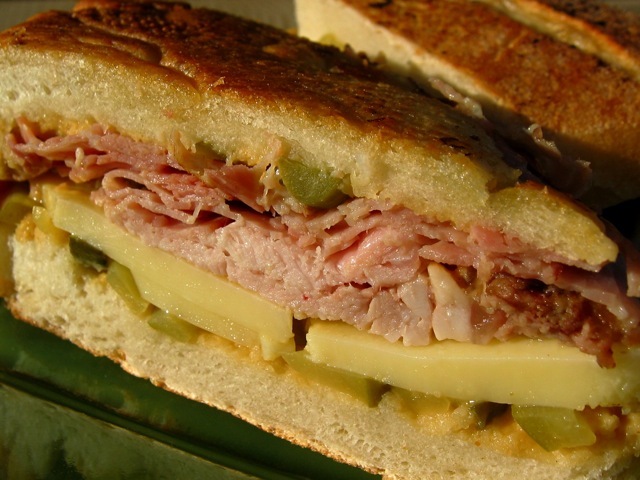 Top with a layer of ham, followed by a layer of roast pork, and ending with a layer of cheese. Press down on the finished sandwich with your hand, flattening it somewhat to keep it together. Brush tops of sandwiches with melted butter.